This past week some of my coworkers brought some Hardee's Biscuits and Fried Chicken in for lunch. Now, I haven't visited a Hardee's in years, partly due to gluten-free diet, but also due to my personal pledge to avoid fast food. But when I had a smell of those amazing biscuits I remembered when I was a kid and my mom would make us Bisquick biscuits and chicken for dinner. 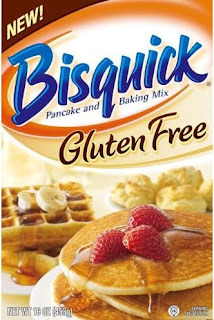 Therefore, this weekend when I was at the store buying groceries, I decided to pick up and try the Gluten Free Bisquick mix, and share my opinion with all of you. Before delving in, I've tried a variety of other gluten free flour mixes. 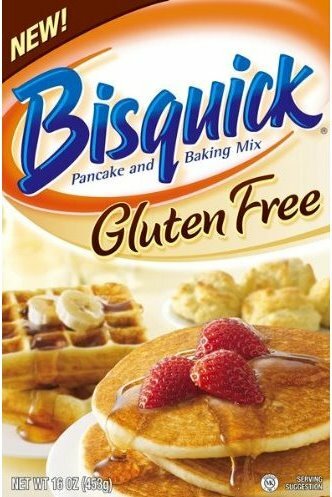 All I've tried before have had generally good success (aside from Bob's Red Mill All Purpose GF Flour, I'm not a fan of the taste), so I expected the Bisquick brand to be comparable. For this test, I followed the recipe on the back of the box to make their gluten free biscuits, and substituted the call for regular milk with buttermilk. It only took about 20 minutes total to make, and surprisingly kept their shape really well. However, I was really disappointed in the texture and dryness of the biscuits. The mix is primarily rice flour with the only other flour blend added being potato starch. I like rice flour and use it in many of my other recipes, but I believe it has to be blended with a variety of other flours. I read a few other reviews, and it seems rather unanimous that Bisquick's GF Mix is a disappointment. Alternative Recommendation: For a relatively comparable cost and set of ingredients, but without the same grainy texture, try all purpose flour from the Gluten Free Pantry, or Jules Gluten Free All Purpose Flour. For alternative buttermilk biscuit recipes, go here.